Real-time marketing is one of those buzzwords that sounds good. But, when you ask someone what it means, you get a pretty fuzzy answer. So, we decided to clarify that answer with exclusive research, produced in association with Econsultancy, that provides a snapshot of the real-time marketing landscape in 2014. Inside this report, you’ll learn how to leverage best real-time marketing practices to drive better customer experiences and increased revenue. More than 50% respondents say they need to interact with customers more quickly. 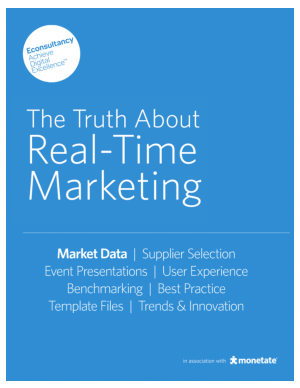 29% of respondents are not engaging in any type of real-time marketing. 85% of respondents say it is fundamental, significant or important to their future business success to provide experiences that are responsive to customers based on real-time, in-the-moment behaviors.